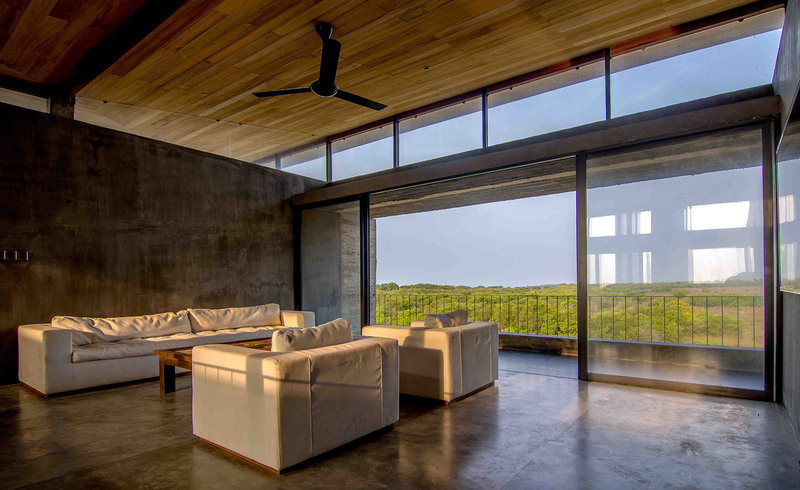 Rising up from the flat grasslands of Jaffna, Sri Lanka, the Oculus, designed by architecture firm Palinda Kannangara, is a residence for staff and visitors at the Jaffna wind power farm. Commissioned by Windforce, the Oculus sits at the first point of the axis which extends across the landscape to the wind farm hosting 16 wind power turbines, and the main monitoring station building, where the wind farm is controlled from. The Oculus is named after the circular opening carved out in the centre of the building’s square roof. A pivot of natural light, water and the changing seasons, the oculus radiates light through the building and frames a view of the towering windmill beside it. Directly beneath the opening on the ground floor, a small pool of water gathers reaching various heights of depth across the seasons and catching the reflection of the windmill. 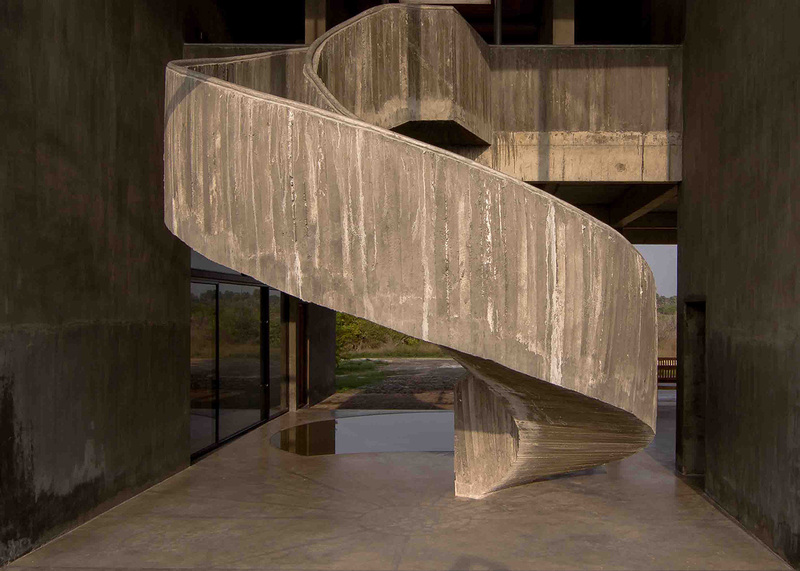 A force of architecture with its concrete form is sturdy and strong, the design is not imposing on the environment, yet sensitive to its seasonal fluctuations and open to its beauty. High ceilings of 14ft and cut out spaces without windows reduce its solidity and open up the ground floor to the grassy landscape, which encroaches into the space at the edges. The ground floor, which is hoisted two feet above the landscape, has a social open-plan design with the shallow pool at the core. The kitchen and dining room are enclosed, as are the caretakers quarters. A rough spiral staircase made of stone pavers winds up to the upper level where the sleeping and living quarters for visiting engineers, staff members and guests are located. Cut out windows in the four corner bedrooms reveal the depth of the concrete, into which glazed and timber screens can be hidden within. The timber screens as well as additional sunshades are designed as layers of protection against the extreme heat of the Jaffna sun, filtering light through to the inner glazed screens. Opened up they display endless views – after the monsoon, the landscape is blessed with clear blue skies extending across the scrubland. Responding in colour and materiality to the earthy hues of the seasonal grasses, the tidal mudflat that extend for miles around the building and the blue-grey surface of the Jaffna lagoon, the polished cement floors and matte cement finished walls of the Oculus are cool and tactile like the exposed concrete form – only the bedrooms are painted white to soften the interior.